Shortbread is a crumbly, sweet butter cookie originating in Scotland. Traditionally, the cookies are made with one part sugar, two parts butter, and three parts white flour. Gradually butter replaced yeast in the recipe, particularly as butter came into common use in dairy-heavy Scotland. The cookie jury is still out as to which monarch popularized the cookie. Evidently Mary, Queen of Scots (who reigned in Scotland from 1542 to 1567) helped the sweet biscuit bread gain notoriety. During the reign of England’s Elizabeth I (1558 to 1603), the cut wedges were called “petticoat tails” after the bell-hooped shaped petticoats worn during that time by ladies of the court. Early on, the cookie was an expensive luxury. Apart from the aristocracy, the treat was reserved for Christmas, New Year’s, and weddings. In a traditional Shetland custom, revelers broke the decorated cookies over the head of a new bride as she crossed the threshold into her new home. The high butter content produces a crumbly texture. Fat inhibits gluten, a protein in wheat, which allows dough to rise. Gluten gives dough a chewy texture. Higher fat content slows down gluten. Its protein strands are then shorter, rather than longer, producing a more crumbly texture rather than a chewy one. The dough is formed and baked a number of ways. Originally, the cookies were baked in large rounds, which were cut into pie-shaped wedges – the petticoat tails of Elizabethan times. In another version, dough is pressed into large rectangular pans and cut into fingers (what we call bar cookies) after baking. In still another variation, the cookies are cut in individual rounds with a cookie cutter or a biscuit cutter. Today, specialty molds also produce elaborate shortbreads. Flavor variations of the cookies abound, moving far beyond the original recipe of butter, sugar, and flour, ranging in extracts, chocolates, nuts, spices, dried fruits, and citrus zests. The texture can be altered by replacing all or some of the flour with rice flour, corn flour (cornstarch), or semolina. Even in cookie land, the value of a name has financial implications. 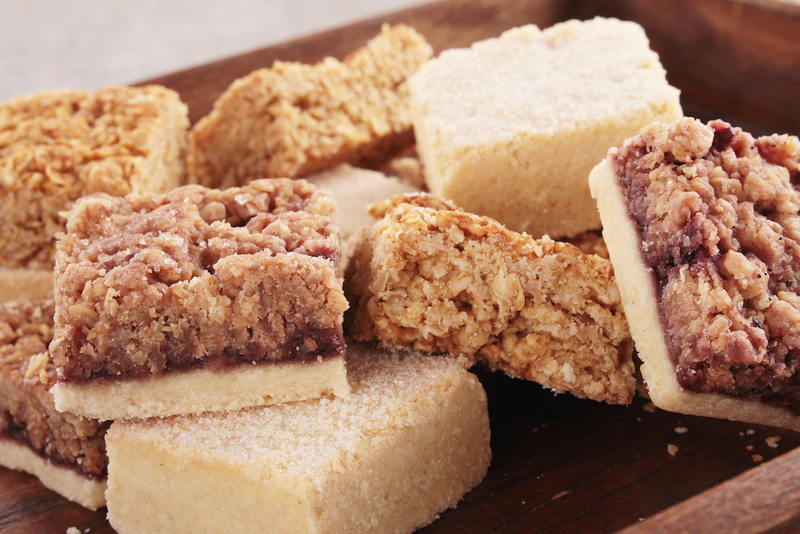 Shortbread has long been classified as a dessert bread. During the 1980s, the European Union attempted to redefine the sweet as a regular cookie rather than a bread, seeking to gain the extra revenue as cookies are taxed at a higher rate than breads. The Scottish Association of Master Bakers stood its ground, claiming that the treat was no ordinary cookie but a dessert bread with a long and honored history. National Short bread Day is celebrated in the United States each year on January 6. Refrigerator Pecan Shortbread: just chill and cut!